Congressman Huffman’s Ad Hoc Committee. Friends of the Eel River has been a participant in Congressman Huffman’s collaborative Ad Hoc process, helping develop locally supported recommendations for the Federal Energy Regulatory Commission. The Eel River is home to many wonderful flora and fauna, including three salmonid species listed under the federal and state Endangered Species Acts; California Coastal Chinook, Southern Oregon Northern California Coho, and Northern California Steelhead. Click here to see Emily Cooper's presentation on Estimating Salmonid Habitat Capacity in the Upper Eel Watershed, from the 2017 Salmonid Restoration Federation Conference. Emily's research indicates that allowing fish passage at Scott Dam would open roughly 79 miles of Chinook habitat, 288 miles of Steelhead rearing habitat, and 181 miles of Steelhead spawning habitat. Click here to read Dr. O'Dowd and Dr. Trush's 2016 Blockwater Investigation, in which they compare current impaired flows with modeled unimpaired flows. Analysis showed that current flows reached critical life history thresholds earlier in the season compared to the modeled unimpaired flows. Click here to read PG&E's 2015 Pikeminnow Monitoring and Suppression Report. Click here to read a Historical Review of Eel River Anadromous Salmonids by Professors Ron Yoshiyama and Peter Moyle. "Records suggest that historic runs of Chinook salmon probably ranged between 100,000 and 800,000 fish per year, declining to roughly 50,000-100,000 fish per year in the first half of the 20th century." UPDATE: Read Friends of the Eel River's Sept 2018 press release about the results of geotechnical analysis conducted by Miller Pacific Engineering Group. Press release and accompanying technical memo here. 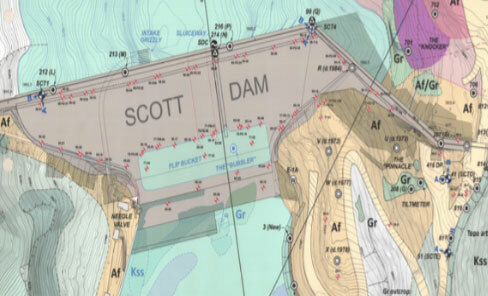 The original plan called for Scott Dam to be constructed in a straight line across the Eel River canyon, and to attach to a substantial rock outcropping on the south side of the canyon, originally believed to be bedrock. During construction, however, this feature, now called ‘the Knocker,’ began to move, revealing that it is in fact a very large boulder, and not bedrock at all (see these photos from 1920 that show 'the knocker' before and after it slid down). The design of the dam was changed to run in front of ‘the Knocker,’ as it does today. In the photo below, the 'the Knocker' is the purple blob directly behind the dam. Many dams are built on or nearly on fault lines because that's where a river channel is naturally most narrow. Scott dam is no exception. 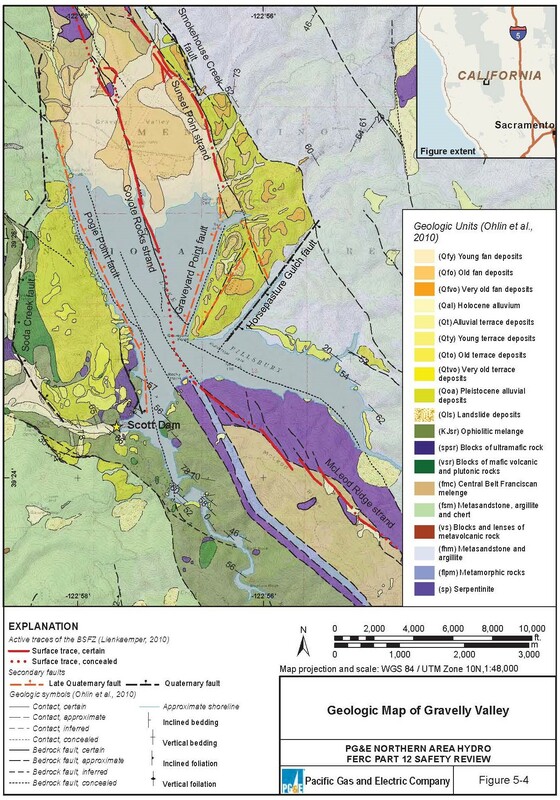 The image below is a geologic map of Gravelly Valley, where Scott Dam is located. Click here to read PG&E's entire report on geology and seismicity. While there is no longer commercial fishing on the Eel River, salmon and steelhead from the Eel are a part of the commercial ocean fishery. Protecting these fish protects local economy. Click here to read the Center for Environmental Economic Development's 2004 study, Economic Benefits to Mendocino and Lake Counties from Removing the Dams on the Eel River. Study authors Dr. Ihara and Marshall conclude that "nature-based tourism benefits to Mendocino and Lake Counties, counting both rafting and increased fishing, are estimated to exceed $2,000,000 annually". The Eel River Dams generate very little energy. Their maximum generating capacity is 9.4 megawatts, but according to analysis by Dr. Rosenblum, the hydropower facility has operated at a maximum of 50% capacity over the last decade. Click here to see Dr. Rosenblum's presentation that includes analysis of hydropower generation at the Eel River Dams (Potter Valley Project) and Coyote Dam in Mendocino, as well as analysis of replacing that energy with solar power.A five acre solar array would more than replace the energy generated by the Eel River Dams. Read PG&E’s Pre-Application Document (PAD) here. 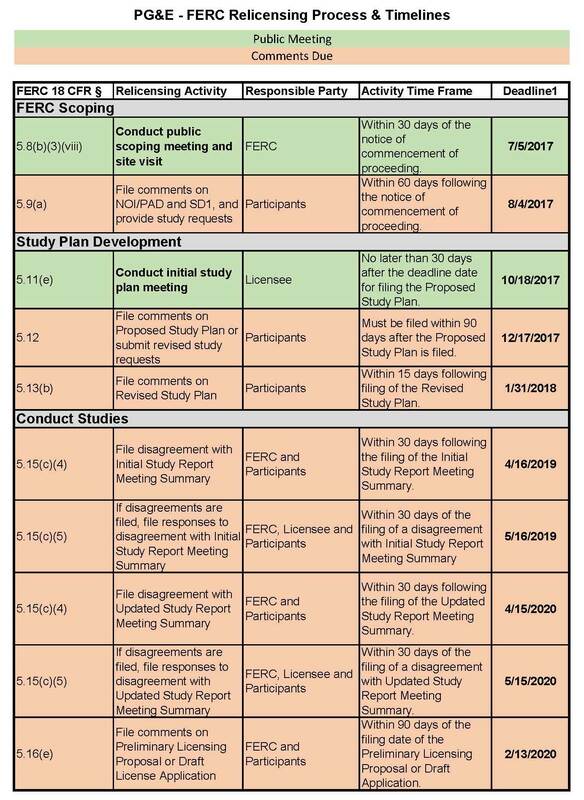 Read FERC’s Scoping Document 1 here. Read FERC’s Scoping Document 2 here.